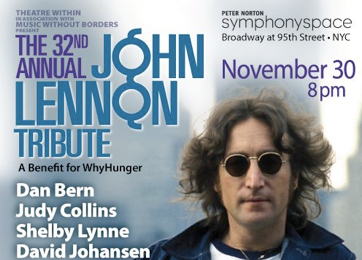 “It’s time again to start work on the Annusl John Lennon Tribute. I can’t believe it is the 32nd year the tribute has been in existence! This year there is such a beautiful groupe of Artists, singing their feelings and interpretation of John’s music. What a wonderful way to celebrate the man, his ideals, and creativity. As production Director, it is a lot of work to put together a very special evening, but when I see audiences enjoying being part of it, it is worth every second I put in. Coordinating with Executive Producer, Joe Raiola, creatively, and Rich Pagano, Muiscal Director is always a terrific experience. Initial task is to get the technical team together -- with a strong team in place, we give the Artists the essential base from which to perform. In addition to the Artists listed above scheduled to perform are The Nutopians Joan Osborne, Rich Pagano, Joe Raiola, and Dar Williams -- How exciting it will be to see Judy Collins, with her accompanist at the Steinway!” More to come as the performance date of November 30th arrives.